For busy people who can’t afford the time but can afford the help, there’s a wealth of talent available. LATE one cold winter’s night last year, Nicolle Hrabe found herself scouring the back alleys of Port Melbourne, plaintively calling the name “Woody” at the top of her voice. Hrabe was on a mission of mercy to find the missing cat belonging to one of her personal concierge clients. In her line of work, answering long-distance pleas for help is all part of the job description. “This particular client lived in an apartment building,” recalls Hrabe. “I knocked on the door of all 360 apartments. Eventually I found Woody.” Not too many years ago, employing someone to do chores or run errands would have been the province of the idle rich, a sure sign of a decadent lifestyle. But these days, employing a gardener, personal stylist, cleaner or dog walker is becoming part of everyday life for many people. And it’s easy to see why: according to the Australian Bureau of Statistics Labour Market report (October 2005), one in five Australians works more than 50 hours a week. That’s a lot of people with very little spare time for chores and errands. Hrabe began her personal concierge service, utilizeMytime, in 2003. The idea for the business came when Hrabe was working long hours, six or seven days a week. “I just couldn’t work out how people got things done,” she says. “It occurred to me that there was a real need out there for personal assistants for people who are time-poor. A lot of people who employ me have an executive PA for work and it’s simply an extension of that to have a PA for home.” Hrabe out sources certain services for her clients (such as finding a reliable gardener or cleaner) and runs some errands herself. Since beginning, the utilizeMytime client list has grown steadily. “Three years ago no one had heard of a personal concierge,” she says. 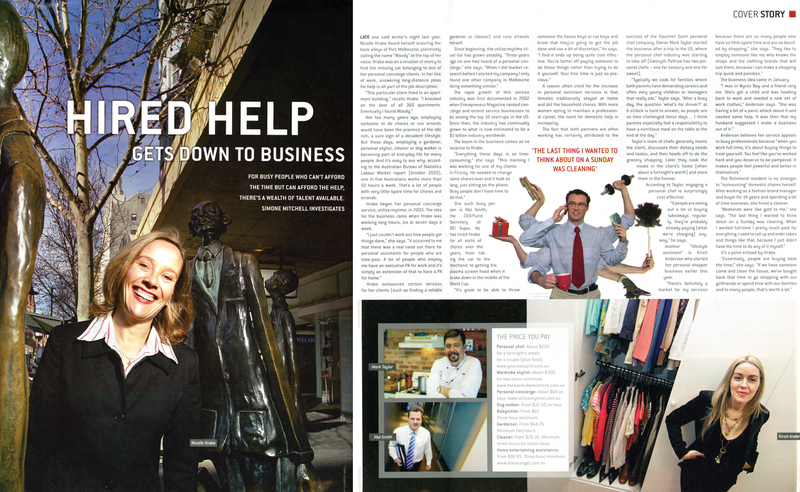 “When I did market research before I started my company I only found one other company in Melbourne doing something similar.” The rapid growth of this service industry was first documented in 2002 when Entrepreneur Magazine ranked concierge and errand service businesses to be among the top 10 start-ups in the US. Since then, the industry has continually grown to what is now estimated to be a $1 billion industry worldwide. The boom in the business comes as no surprise to Hrabe. “Everything these days is so time consuming,” she says. “This morning I was working for one of my clients in Fitzroy. He needed to change some shares over and it took so long, just sitting on the phone. Busy people don’t have time to do that.” One such busy person is Mal Smith, the CEO/Fund Secretary of REI Super. He has hired Hrabe for all sorts of chores over the years, from taking the car to the mechanic to getting his plasma screen fixed when it broke down in the middle of the World Cup. “It’s great to be able to throw someone the house keys or car keys and know that they’re going to get the job done and use a bit of discretion,” he says. “I find it ends up being quite cost effective. You’re better off paying someone to do these things rather than trying to do it yourself. Your free time is just so precious.” A reason often cited for the increase in personal assistant services is that females traditionally stayed at home and did the household chores. With more women opting to maintain a professional career, the need for domestic help is increasing. It’s a point echoed by Hrabe. “Essentially, people are buying back the time,” she says. “If we have someone come and clean the house, we’ve bought back that time to go shopping with our girlfriends or spend time with our families and to many people, that’s worth a lot.